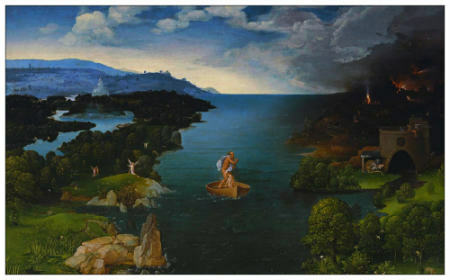 Joachim Patinir was born in Belgium. His landscapes immediately became acclaimed for their atmospheric, ethereal beauty and unbelievable technical precision. The concept of World Landscape or Weltlandschaft originated with Patinir. Patinir is considered the first landscape painter in the history of Western art. His visionary landscapes are mythology and religious themed with moralizing overtones. He became one of the most important Northern Renaissance painters working in Antwerp in the 15th Century. Author James Edward Parrott descibes the city, "Antwerp, with its deep and convenient river, stretched its arm to the ocean, and caught the golden prize as it fell from its sister cities' grasp. No city except Paris surpassed it in population; none approached it in commercial splendour." James Edward Parrott further states "The city began to decline during the reign of Philip II., who was King of Spain and master of the Netherlands. In 1576 Spanish soldiers whose pay was in arrears broke into mutiny, and stormed and sacked several of the richest towns of Flanders, including Antwerp. Early in November of that year they entered the city, burnt more than a thousand houses, slew more than eight thousand citizens, plundered right and left, and behaved with the utmost cruelty. Such was the "Spanish Fury," which still forms a landmark in Flemish history. With the help of William of Orange, the Spaniards were driven out of Antwerp."